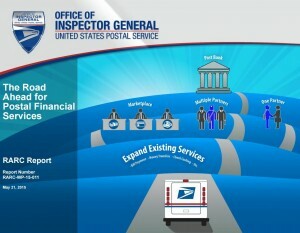 05/21/2015 – A report by the USPS Office of Inspector General (OIG) released May 21 outlines the next steps for implementing postal banking, in which post offices would offer basic financial services – providing affordable banking transactions to every zip code in the US, while strengthening the Postal Service. The May 21 report titled, “The Road Ahead for Postal Financial Services,” states that expanding and enhancing existing financial services such as money orders, international money transfers, check cashing and bill payments could be accomplished without an act of Congress. 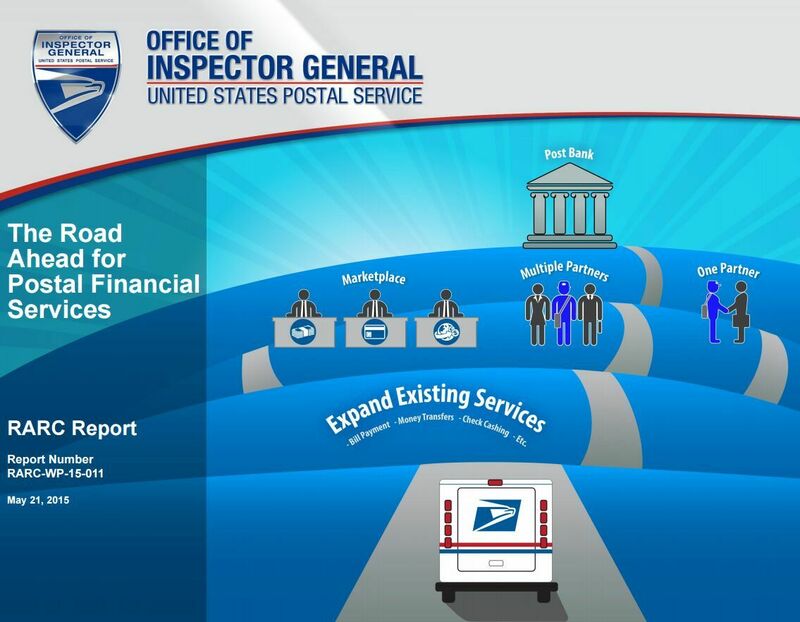 While highlighting the impact postal banking would have on the financial health of the Postal Service, the OIG also recommends that the USPS focus on the affordability of the services it could provide. Among the expanded offerings, post offices “could provide ATMs where recipients of government benefits could withdraw funds without paying a fee,” the report says. Dimondstein praised the idea. “It’s a no-brainer,” he said. “The Inspector General’s report confirms that the Postal Service can act now to provide consumers with affordable financial services while strengthening our trusted national treasure, the public Postal Service. “We look forward to the day when people can get their checks cashed by their trusted neighborhood window clerk,” he said. The APWU is a member of the Campaign for Postal Banking, a coalition of consumer, worker, financial reform, economic justice, community, civic, and faith-based groups that is organizing support for the concept. For more information, visit www.CampaignForPostalBanking.org. The OIG’s report contains interesting observations and recommendations on ways the Postal Service can begin to serve the needs of 68 million adults in this country who have either no access or only limited access to basic financial services. Of particular interest are services that the Postal Service could immediately pursue since it already has the authority to provide such services as money orders, post-office-to-post-office money transfers, bill payment, check cashing, international remittances and automatic teller machine (ATM) access. These basic services would give a much-needed option to those with no alternative available in their communities. Because post offices are located everywhere—urban centers, suburbs and rural America; not simply located according to profit models—they are a ready-made network for people to come to, to obtain affordable financial services administered by highly trained, experienced and trusted public servants. This infrastructure includes more than 30,000 post offices and is the largest, best-distributed physical network in the country. This model has been successful in many other countries and has the potential, according to the OIG, to generate at least $1.1 billion of revenue annually, which would allow the Postal Service to continue its innovative efforts. The OIG’s recommendations are a good place to start, and we urge the Postal Service to take steps to immediately pursue these opportunities to fill the unmet needs of those in underserved communities. Can the USPS do more to profit from online returns? With all those designer shoes, cutting-edge electronics, and trendy toys shipping into our homes via ecommerce, it’s only logical that sometimes the shoes won’t fit, the electronics won’t work, and the kids will have already moved on to the next hot toy. The bottom line is that some of the stuff we buy needs to be returned. And that’s known as reverse logistics. As the offspring of the enormous ecommerce business, domestic shipping returns currently generate about $3 billion annually in revenue for the package delivery industry, and could reach $4 billion by fiscal year 2016. Shipping returns’ first cousin, package forwarding, is also booming as customers increasingly expect more control over when and where their packages will be delivered. The U.S. Postal Service is active in the returns and forwarding markets, and offers a variety of products and services, such as Parcel Returns Service, Bulk Parcel Return Service, and two Premium Forwarding Services – one for homes and one for businesses. Recently, the Postal Service has been promoting its built-in advantage over other providers – its 6-day-a-week delivery and its free package pick-up service. But can it do more to get its chunk of the reverse logistics market? We think so. Our recent white paper on the topic found several services the Postal Service could offer to take advantage of its strengths.